In today’s lesson I am going to give you three approaches to breaking out of acoustic Blues guitar ruts. By adding a capo and changing your tuning from standard (E A D G B e) to DADGAD you can explore new exciting sounds. Make sure you watch the YouTube video below as well as reading the article for the full and slow speed examples. 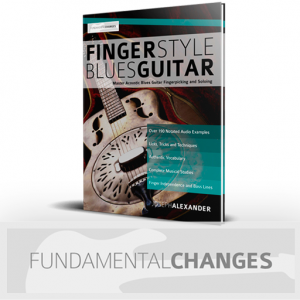 Open string licks have a distinct sound and are favoured by blues guitarists. The addition of a capo means we can play open string licks in any key. Example 1 uses the open E blues scale (E G A Bb B D) with the capo at the 6th fret. Although on paper it may not look overly complicated, the amount of techniques used in these three bars is vast, so as always start off very slowly with a metronome at around 60 beats per minute before speeding up to the required tempo. Don’t buy a cheap capo or very quickly you will need to buy a quality one to replace it. I recommend Kyser capos. One of the incredible advantages of the guitar is that the tuning can change. Although standard tuning (E A D G B e) is by far the most commonly used, DADGAD is a favourite among guitarists searching for a new sound. By lowering the low E string to a D, the B string to an A, and the high e string to a D you can create this incredible tuning. Example 2 demonstrates a raw DADGAD acoustic blues idea which is based around the the droning note of D. The double stop bends featured in bars two and five sound great and are reminiscent of acoustic blues tracks such as Hey Hey by Eric Clapton. Example 3 builds on the previous two examples by using both DADGAD tuning and a capo. This lick alternates a bass note and the rest of the chord shape and has a country acoustic blues sound. I highly recommend checking out Josephs book Fingerstyle Blues Guitar for lots of standard tuning blues licks, and my new book on DADGAD will be available soon.